One of the best parts of spring is finally being able to get outdoors after being cooped up all winter. The sun is out. Flowers are blooming. Birds are singing. It’s about time to drag out the patio furniture and wipe down the barbecue – don’t you think? How about we celebrate spring with a garden party? 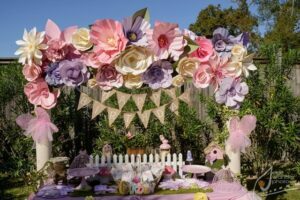 Whether you’ve got a little one with a birthday coming up, have been missing some girls-only time, or just want to get together with friends and family garden parties are a cheap and fun way to do it. Here are some garden party ideas to help you plan your upcoming occasion. You don’t have to break the bank to get beautiful centerpieces for your garden party. Consider arranging pieces of fruit in a simple basket-not only will you get a cute centerpiece but you may encourage some healthy snacking. Another great garden party idea for a centerpiece is to use fresh flowers from your garden. 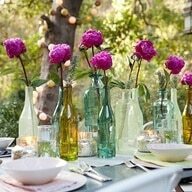 Repurpose containers like old wine bottles to display them. No garden party would be complete without party favors! Instead of cheap plastic toys that are sure to be lost or broken in no time, head to the nearest home and garden center and purchase small plants to hand out. As the plant grows, your guests will be reminded of the wonderful time they had. 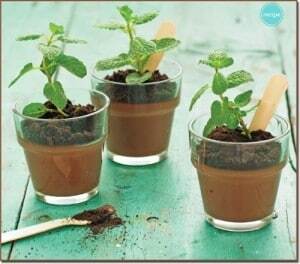 Get creative with this garden party idea. Instead of buying individual plants, buy a tray of plants and then spend time with your kids putting them into little terra-cotta pots. Want another idea? Have you ever heard of paint-by-the-glass? It’s a thing where you get together with your friends and paint a picture while drinking wine. How about if you and your friends enjoy some wine in the garden while decorating terra-cotta pots and planting a flower inside? The garden party ideas around food are basically limitless. 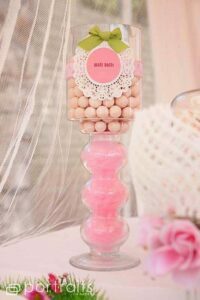 For example, simple candies make a table look stunning. Color coordinate them with your theme like pink wrapped Hershey kisses, malt balls, and a vase of strawberries. Consider doing a smorgasbord of food buffet style. 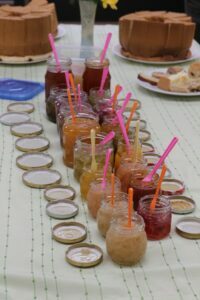 For example, you could offer an array of homemade jams with fresh bread and scones or a variety of cheeses to go with wine and crackers. Want fancy glasses and dishes for your garden party but just don’t have the budget? With a little creativity you can cultivate just the feel you want at your garden party without spending a fortune. 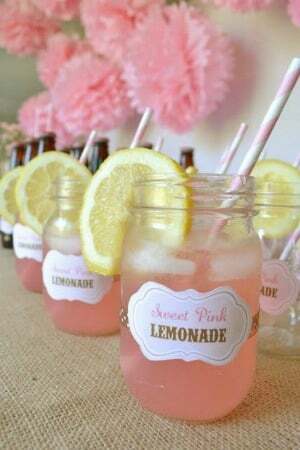 For example, use Mason jars as glasses to give the party a rustic, laid back feel. You can pick up Mason jars cheaply at local garage and estate sales. Head to your nearest home improvement store and pick up a few slate tiles to use as serving trays. If you need garden party ideas revolving around decor, just take a look around. Honestly, the very best decor for a garden party can be found in nature. 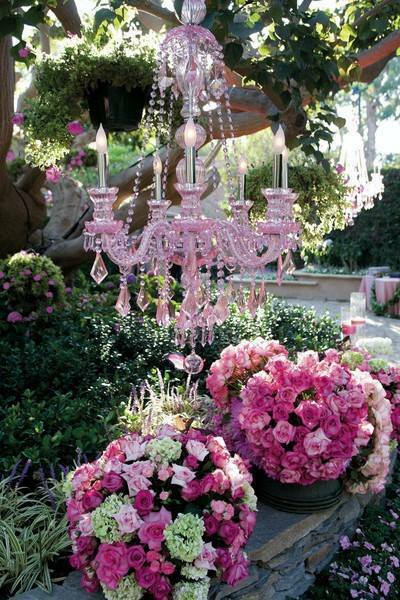 However, if you want to add a little glamour to your garden party, consider repurposing an old chandelier. You can spray paint it a pretty color that matches your theme and then hang it from a tree. If you simply don’t have much of a green thumb but can’t afford real flowers for your garden party, consider making some paper flowers. This can be a fun activity to do with the little ones. Keep in mind that this is your garden party so you don’t have to stick with traditional decor. Think outside the box, delve into some really unique garden party ideas. 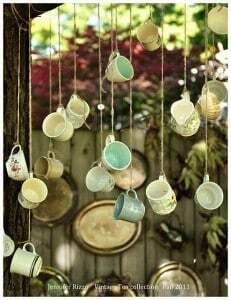 For example, if you’re having a tea party or maybe an Alice in Wonderland themed birthday party, consider hanging small tea cups from a tree. When decorating on a budget, incorporate balloons whenever and wherever possible. 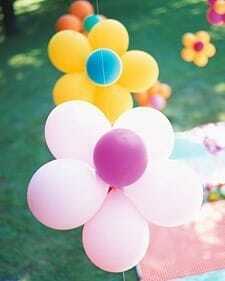 Balloons may seem like child’s play but they really can be used to create stunning and cheap decor. Bonus, after the garden party is over, you don’t have a lot of wasted flowers to throw out. You can have a successful garden party without the high price tag. All it takes to pull it off is a little creative thinking. 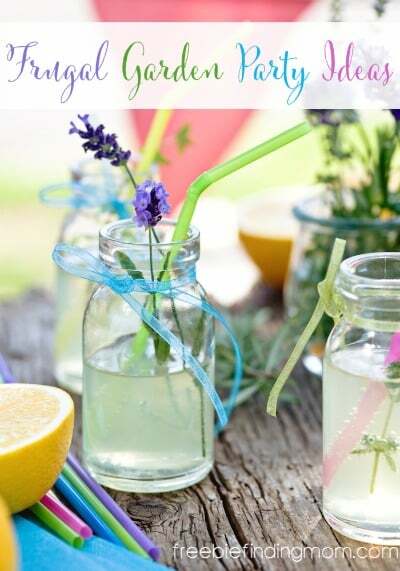 Use these garden party ideas plus those on Freebie Finding Mom’s Garden Party Ideas Pinterest board to get truly inspired this spring. Do you have more frugal garden party ideas? Share them in the comments! Spring is such a great time to have a party! Love all these fabulous ideas!